Do you want to create targeted campaigns towards new or returning visitors? With OptinMonster, its easy! Follow this guide to learn how to use OptinMonster’s new vs. returning targeting feature. What is the New vs. Returning Rule? How do I test my campaign using these rules? REQUIREMENTS: This feature requires a Growth subscription. The New vs. Returning rule lets you target your campaign to visitors who are either new and visiting your website for the first time, or who are returning and have been to your website before. If neither cookie exists, we know the visitor is new. If only the _omappvp cookie exists, we know the visitor is returning. How to Use the New vs. Returning Rule? 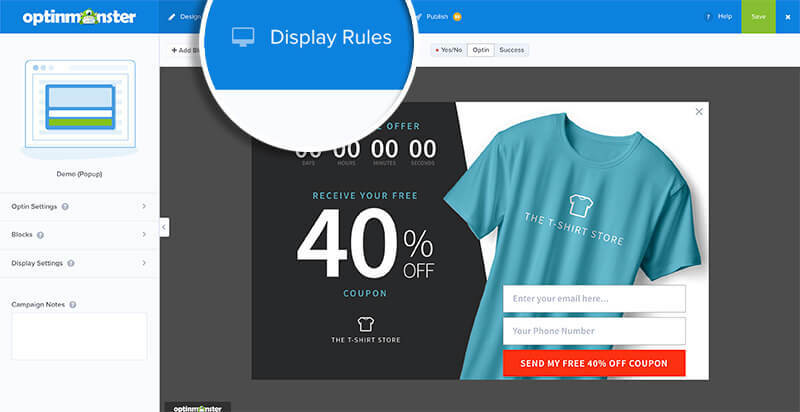 First, go to the Display Rules tab of your campaign. Looking for more information about advanced page targeting? See our article on how page-level targeting helps you generate more leads. Q: How do I test my campaign using these rules? Clear your browser’s cookies before testing any campaign configured to show only to new visitors. This will be sure that neither the _omappvp or _omappvs cookie exist in the browser, indicating to OptinMonster that you are a new visitor. Visit a page of your site where a campaign is embedded to appear, allowing OptinMonster to set both cookies in the browser. Next, you will need to leave the site for 10 minutes, after which the session cookie will self-delete. (We used to rely on browsers clearing “session” cookies when a browser window/tab was closed, but this method has become unreliable, so we have set a 10-minute limit). Finally, re-open your browser program and navigate back to your site to test the appearance of any campaign configured to show only to returning visitors.